In an era where technology is always advancing, it’s important that we take advantage of the tech in ways that can make life better. Jeep Grand Cherokee is equipped with an EcoDiesel V6 engine that’s both fuel-efficient and less harsh on the environment. Moose Jaw drivers shouldn’t be forced to choose between great power and performance of better fuel economy any longer. With the innovative EcoDiesel engine available on the Jeep Grand Cherokee this is no longer the issue. 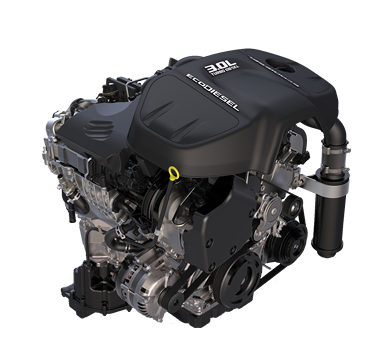 The EcoDiesel engine has found ways to improve the typical diesel engine design to maximize fuel economy, engine lifetime, and performance. Even with the new five-cycle fuel efficiency ratings, the EcoDiesel V6 engine continues to boast low fuel consumption numbers at 11.2 L/100km in the city and 8.4 L/100km on the highway. In addition to this, the EcoDiesel engine also gives the Jeep Grand Cherokee the endurance for larger tow loads – much easier than the decked-out gasoline engines. Even when using the Grand Cherokee’s engines as an example we can see that the 3.0L EcoDiesel engine is able to tow 3,265 kg while its 3.6L Pentastar VVT V6 engine is able to pull slightly less at 2,812 kg. While they’re both impressive towing capacities, we can clearly see that the EcoDiesel is better suited to carry out really heavy towing jobs better than a regular engine. Part of getting the best performance and fuel-efficiency from your diesel engine is making sure that it is correctly maintained at all times. Luckily, with the EcoDiesel engine this is simple because even though it is able to get higher fuel economy than other diesel engines, it is still able to keep your oil levels and diffuser tubes cleaner for longer. Keeping these elements clean for longer means that your EcoDiesel engine will require a lot less maintenance than a typical gasoline powered engine. On top of that, diesel engines also have longer lifespans than gasoline engines, so proper maintenance just keeps them running for even longer than predicted, making owning a diesel engine very budget-friendly. With so much to offer, why would you settle for anything less than the power that a Jeep Grand Cherokee diesel engine can offer you? Join the many other Saskatchewan drivers getting in on the diesel engine action by stopping in at Crestview Chrysler Dodge Jeep Ram today at 601 Albert Street in Regina. You can also contact us over the phone at 888-449-0943 to schedule a service appointment or test drive today.